Toronto-based choreographer and dancer Esie Mensah’s Shades premiered at the Factory Theatre with a short run, September 27 to 20, 2018. Shades is an exploration of the discrimination between lighter-skinned and darker-skinned members of communities of colour, known as shadeism. This work addresses how the privileging of skin tones leads to fractures in communities of colour, laying bare the pain resulting from tone based social hierarchies. Mensah blends her personal movement vocabularies of traditional and contemporary African dance with urban and contemporary styles, carving out her own brand of Afrofusion dance. Percussionist Santosh Naidu and bass player Ian DeSouza composed the original accompaniment, merging African beats with modern soundscapes. 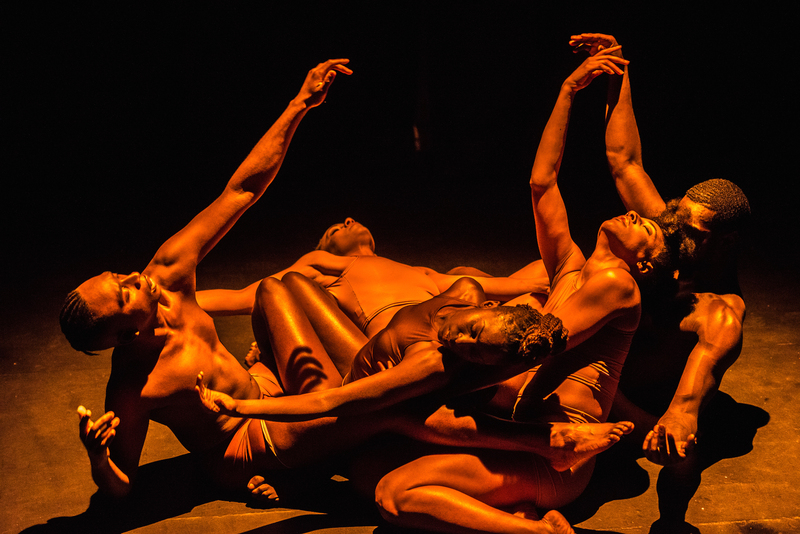 Mensah, along with her dancers; Percy Anane-Dwumfour; Miranda Liverpool; Tereka Tyler-Davis; Roney Lewis; Allyson Trunzer; and Shakeil Rollock; make great use of humour and emotional connection to trouble the concept of the ‘ideal body’. While it was easy to get swept up in the pulsing African moves and beats, where Shades really delivered was on the lengthy introduction that took the time to give a nuanced movement vocabulary and characterization to each dancer, building a garden-of-eden type world of love and acceptance… oh the possibilities! We the audience are invited to witness a utopic origin story, an imagining of a non-discriminatory community, animated by joyful inquisitive creatures who take pleasure in individual uniqueness. However the utopia breaks down as uncategorized strangers are encountered, resulting in the horrendous pain of social isolation.